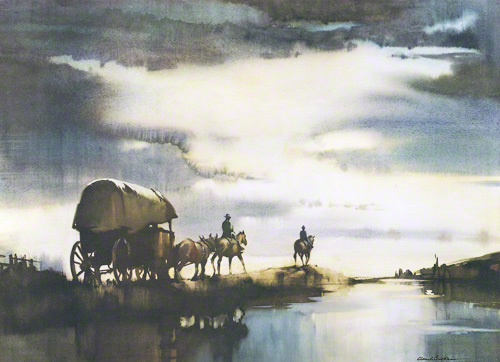 This water colour painting by Claude Buckle showing a horse drawn carriage and another rider and horse was re-produced by the Medici Company in the 60's. This picture is very characteristic of the Buckle style showing a wonderful water scene as well as demonstrating the artist's talent for painting horses. The sky is also particularly interesting with contrasting light and dark areas to represent the dawn. Created in 1965.